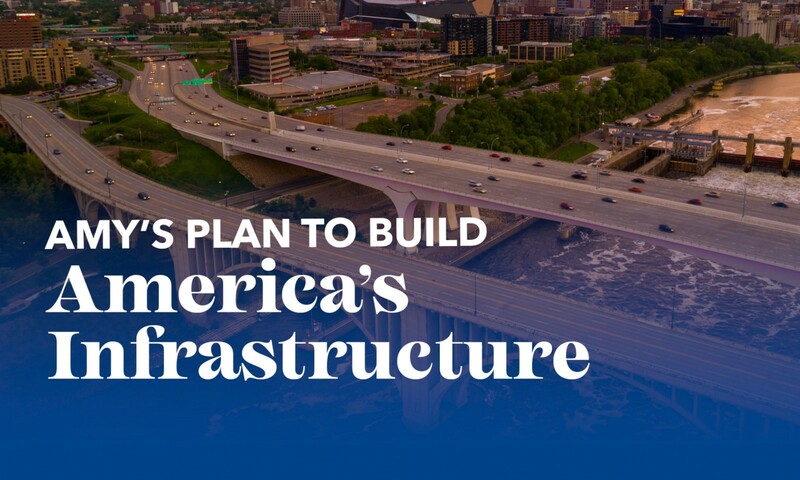 Amy is proposing a bold, trillion-dollar plan to rebuild America’s infrastructure, invest in our future, and create millions of good-paying American jobs. President Trump is asking Congress for $200 billion for infrastructure in his budget proposal that will somehow support an over a trillion-dollar investment, but his plan is a mirage and he leaves the details up to lawmakers. In contrast, Amy has a concrete, commonsense proposal that will invest in our future and make sure our country’s infrastructure is second to none. Amy’s infrastructure plan will be her top budget priority, and she will work to get it done during the first year of her presidency. And she has a proven track record of delivering results. When the 35W Bridge collapsed into the Mississippi River, Amy got the funding and the bridge was rebuilt in just 13 months. America needs a President who will get things done and pass progressive policies that keep our country moving. Repair and replace our roads, highways, and bridges. The collapse of the 35W Bridge was a tragic reminder that America has failed to maintain the roads, bridges, and other public infrastructure that keep our people safe and our economy strong. Amy will make smart investments to repair and replace our roads and highways, reduce congestion, upgrade America’s over 50,000 structurally deficient bridges, fix the roads and bridges washed out by the recent floods in the Midwest, eliminate the “pothole tax,” and stabilize the Highway Trust Fund. A world-class transportation system will increase our safety and lower costs for commuters and businesses that depend on getting goods to market. Provide protection against flooding and update and modernize our airports, seaports and inland waterways. Amy will increase public investment in our airports and modernize our aviation system so air travel is safe and efficient. She also understands that the economies of many communities depend on America’s inland waterways and ports and that allowing these assets to fall into disrepair hurts our economy. That’s why Amy is committed to updating our ports, locks, and dams, as well as investing in our inland waterways to accommodate anticipated growth in waterborne traffic. And beyond waterborne cargo, Amy’s plan will invest in updating our levees and provide critical additional protection against the serious threat of flooding. Expand reliable public transit options and update rail infrastructure. Our country’s investments in public transit have not kept pace with the demand for reliable public transportation, particularly for low-income communities and communities of color. Amy will increase investments in public transit with a focus on decreasing barriers to opportunity and reducing our energy consumption, overhaul our rail infrastructure when it comes to freight and passenger rail, and bring high-speed rail to more communities. These investments will strengthen our communities and make it safer and easier to get to work and school. Rebuild our schools and overhaul our country’s housing policy. K-12 public schools represent the nation’s second-largest infrastructure sector and the condition of school buildings is critical for advancing student performance, classroom learning, and student health. A 2017 survey found that half of America’s public school buildings need improvements to be considered in “good” condition. And while school building conditions are a national problem, the disrepair of America’s public schools disproportionately affects students in low-income communities that cannot raise funds for maintenance, repair, or modernization. Amy will fix our crumbling and unsafe schools, update the physical and digital infrastructure needs of our schools, and establish an ongoing role for the federal government to invest in school infrastructure. All students deserve a good learning environment, regardless of where they live. Amy will release a comprehensive housing policy in the weeks to come. Connect every household to the internet by 2022. Roughly one in four rural Americans say access to high-speed internet is a major problem. That’s why as President, Amy will connect every household in America to the internet by 2022. Amy’s plan will help close the urban-rural divide by creating accurate broadband maps to identify areas that lack adequate access, focus on bringing high-speed internet infrastructure to areas most in need, and provide greater incentives for existing providers to use funds to upgrade their networks to cover unserved and underserved areas. Broadband creates jobs, opens new economic opportunities, and allows America to compete and succeed in an increasingly digital world. Build Climate Smart and Green infrastructure. Amy’s plan makes a down payment on transforming our economy from one reliant on fossil fuels to one that depends on clean energy. That means sweeping legislation that invests in green infrastructure, modernizes our aging energy infrastructure so that it is secure and efficient, strengthens bioenergy capabilities, puts incentives in place to overhaul our building codes, and invests in energy efficiency retrofits and rural renewable energy development. Amy will also help states and cities plan for the impacts of climate change by building stronger, more resilient transportation networks and public infrastructure to withstand rising sea levels, a changing climate, and extreme weather. This means good-paying jobs for people across the country, investments that ensure cleaner and greener communities and workplaces, and a commitment to doing something real about climate change. Ensure Clean Water. For far too long, America has been underinvesting in the drinking and wastewater systems that keep our communities healthy and safe. Amy will make a historic commitment to addressing our drinking and wastewater infrastructure so that all Americans — including those in low-income communities, communities of color, and rural communities — have reliable access to safe and clean water. Amy will also make a serious investment in sewer and sanitation systems. She is committed to protecting public health for all communities, especially the most vulnerable populations, and to ensuring that communities have the resources they need to immediately respond to any water-related crisis. Boost federal infrastructure investment. In parts of our country where communities are not as densely populated or former hubs still adjusting to the loss of manufacturing jobs, it can be difficult to attract private investment. That’s why Amy’s plan includes more than $650 billion in federal funding for infrastructure. And she is committed to ensuring that there is public engagement and transparency in the infrastructure planning process. For projects supported by direct federal funding, Amy will maintain Davis-Bacon wage standards (and where possible, a living wage floor) and other worker and environmental protections. She will invest in workers through robust training with a focus on creating career opportunities in construction for women and people of color. And she will ensure that these projects use materials produced in the United States through strong Buy America provisions. Help states and localities leverage private funds. Amy will establish an independent, nonpartisan Infrastructure Financing Authority to complement existing infrastructure funding. The Infrastructure Financing Authority will help states and localities better leverage private funds to build and maintain the nation’s outdated infrastructure. Amy would allocate an additional $25 billion in seed money to support an additional $250 to $300 billion in direct loans, loan guarantees, and other forms of credit enhancement. It would also direct funding to projects in rural areas so that smaller communities can make much-needed infrastructure improvements. The bank will maintain prevailing wage standards (and where possible, a living wage floor), strong worker and environmental protections, along with domestic sourcing requirements for project materials. Issue “Move America Bonds,” “Build America Bonds,” and Clean Energy bonds. Amy would bring back the Obama Administration’s “Build America Bonds,” which provided states and local governments a direct 35 percent subsidy in lieu of the traditional tax-exempt bond and generated more than $180 billion to finance public infrastructure projects. Amy also supports the “Move America Bonds” which build off of the “Build America Bonds” but also allocate tax credits to private-sector purchases to attract capital investment to public infrastructure. Here, an $8 billion investment from the Treasury would support over $200 billion in investments in infrastructure projects over 10 years. She would also establish a Clean Energy bond program to expand clean energy tax incentives. Ensure revenues collected for the maintenance of our infrastructure are used for their intended purpose. Any revenue collected for the maintenance of our infrastructure must be used for that purpose. For example, Amy will make sure that money paid by shippers into the Harbor Maintenance Trust Fund is used for its intended purpose. Currently, collected revenues in the trust fund are not being used to pay for maintenance. Pay for infrastructure proposals with a series of corporate tax reforms. To pay for this infrastructure investment, Amy will make a number of corporate tax reforms including adjusting the corporate tax rate to 25%, closing loopholes that encourage U.S. companies to move jobs and operations overseas, establishing a financial risk fee on our largest banks, and increasing efforts for tax enforcement.